As cofounders of the leadership coaching and training firm Ridge Associates, authors Robert Bolton and Dorothy Grover teach that good interpersonal communication is essential to getting things done. In this comprehensive and practical guide, they offer a proven method for understanding the key behavioral styles of those around you (including your own) and explain how you can leverage the strengths and weaknesses of each to relate to others--even the most difficult of coworkers--more winsomely. People Styles at Work . . . and Beyond does this by offering a self-assessment to determine which style you are and then uses that information to teach readers how to: recognize how they come across to other coworkers; read others' body language and behavior to identify the best ways to work with them; make small adjustments that will dramatically increase the quality and productivity of their interactions; find common ground with different people while retaining their individuality; relate less defensively and more effectively no matter how others act At work, at home, and even while you're out running errands, your ability to relate to others affects how well you get things done. Now including all new material on personal relationships, parenting, and more, this is the ultimate how-to can help any reader avoid conflicts and enhance important relationships. Robert Bolton and Dorothy Grover Bolton are co-founders of Ridge Associates, which specializes in people skills training, leadership development, interpersonal communication, and performance management. Their training and coaching clients include many Fortune 500 companies and executives. 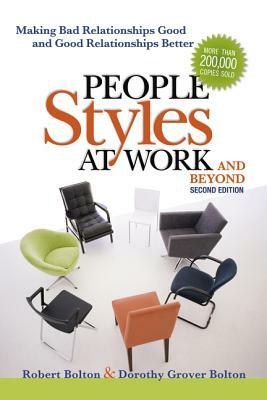 They are the authors of Social Style, Management Style.